Local environmental group, the Plaster Creek Stewards from Calvin College detail how to install a native plant rain garden in one's yard or on the grounds of local schools, businesses or places of worship. Rain gardens have become an increasingly important tool in many urban areas for addressing the negative aspects of stormwater runoff. Over the last few years, Plaster Creek Stewards have worked with homeowners to install more than 40 gardens and bioswales in the Plaster Creek Watershed. While maintenance of rain gardens and bioswales is very important, once established they require less work than traditional gardens or turf grass. Installing a native plant rain garden in local yards or on the grounds of local schools, businesses or places of worship is a great way to improve Grand Rapids' environmental footprint and increase biodiversity in its neighborhoods. Rain gardens are designed to capture stormwater runoff, which flows from impermeable surfaces like driveways, roofs, and roads, and partially permeable surfaces like lawns. This stormwater brings with it many pollutants from those surfaces, including excess fertilizers and pesticides, motor oil, pet waste, sediments, and also heat (thermal pollution). As these gardens catch stormwater, they allow the water to soak in through the ground filtering out contaminants and cooling the water in the process. Capturing stormwater runoff on the land in this way prevents it from flowing into storm drains, which drain directly into local streams without being treated. The deep roots of native plants provide channels to help the stormwater travel down into the soil, and they also absorb lots of water themselves. Additionally, soil microbes help as well by treating many of the pollutants. 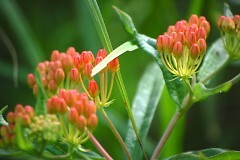 The native plants in these gardens also provide food and habitat for the local butterflies, birds, and other animals. In these ways rain gardens provide many different services to the environment. Rain gardens have become an increasingly important tool in many urban areas for addressing the negative aspects of stormwater runoff. Over the last few years, Plaster Creek Stewards have worked with homeowners to install more than 40 gardens and bioswales in the Plaster Creek Watershed. While maintenance of rain gardens and biswales is very important, once established they require less work than traditional gardens or turf grass. If you’re interested in learning what it will take to maintain a rain garden, here’s some info that should help you. Since rain gardens are planted with native plants that are adapted to local climatic conditions (rain, heat, seasons), they won’t require much maintenance once established. But it generally takes 2- 4 years to get to the point where the plants are fully established. There are several things a homeowner can do during these early years to better insure a healthy and beautiful garden. 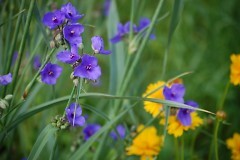 Initially, rain gardens are susceptible to being taken over by weeds. Weeds can crowd out native plants, and typically don’t filter stormwater as efficiently or provide the same beneficial wildlife habitat. It is important to keep weeds at bay during these early years of a rain garden in order to help tip the scale in favor of the more desirable native plants. Once they are well established the native plants do a great job of warding off future weeds all by themselves. To help garden owners identify weeds Plaster Creek Stewards created a Rain Garden Maintenance Guide with pictures of common weeds along with tips and frequently asked questions. Plaster Creek Stewards has also created an open Facebook group, Rain Garden Maintenance where gardeners can post pictures of plants and can get help identifying them as a weed or a native plant. To control weeds, pull them as opposed to spraying herbicide. In addition to the risk of herbicide drifting onto native neighboring plants, most herbicides contain surfactants that can harm aquatic life if they get into water. At the same time, there are situations where herbicide may be the best option—for example, when dealing with large areas of well-established weeds that are connected by network of underground roots, such as Quackgrass, Reed canary grass, or Phragmites (Giant reed grass). When pulling weeds, it is important to remove the whole root, otherwise the weed will grow back. It is helpful to become familiar with which weed species have different types of roots so that you can most effectively remove them. 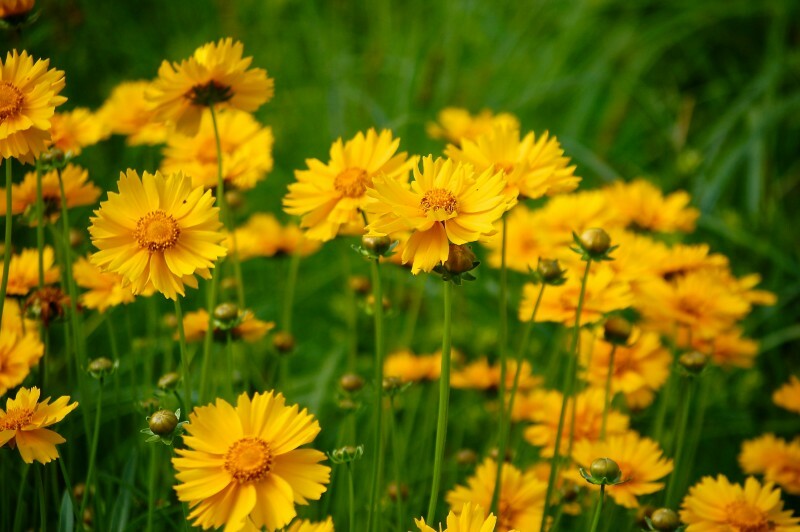 For any type of root, the best time to pull weeds is after a rain when the soil is moist and soft. Mulch or woodchips can be another effective way of discouraging weeds, although using mulch may raise the expense of your garden. For the gardens the Stewards plant, generally mulch is used the first year or two before the native plants have had a chance to fill in all the open spaces. Since many of these native plants will be producing seeds and spreading themselves, it is important to try hard not to weed out the desirable young native plants when removing the undesirable non-native ones. One additional consideration is weed disposal. If the weeds removed contain viable seeds, it is best not to compost them because one may unintentionally be providing these weeds a new habitat in which to flourish. It’s natural for some plants to do better than others in local rain gardens and some patches of native plants may even do too well. When this happens, homeowners may want to move certain species around, thin them out, or prune some out. When a plant is moved from one location to another, this is very stressful for the plant. It is best to transplant when the soil it is very moist and to be sure to water the plant generously after relocation. It also helpful if one can keep as much soil as possible packed around the roots when the plant is transferred. After a plant is finished flowering, leave dead plant stems and seed heads in gardens over the winter because this provides food and habitat for winter birds and insects – an important provision for biodiversity that native rain gardens can provide. This practice also allows native seeds to go through a natural winter treatment, which will enhance their ability to germinate and thrive the following spring. However, if the standing dead stalks in the rain garden are a bit too much of an aesthetic challenge for the home or for neighbors, cutting down the stalks is always an option. When a rain garden receives a lot of sediment along with the stormwater runoff, it is important to keep the entry channel mostly clear so it can continue to receive water. If the entry channel is comprised of rocks, it is also important to periodically clean debris out of the rocks so they can remain porous. For example, curb-cut rain gardens receive stormwater directly from the road, carrying with it all the pollutants, sediment, and debris that fall on the road. Over time these sediments and debris accumulate, and if not removed, limit the rain garden’s ability to process stormwater. In contrast, it is fine to keep leaves and other organic debris in the mulched areas of a rain garden where they can act as a natural mulch and fertilizer as they break down and supplement the soil.